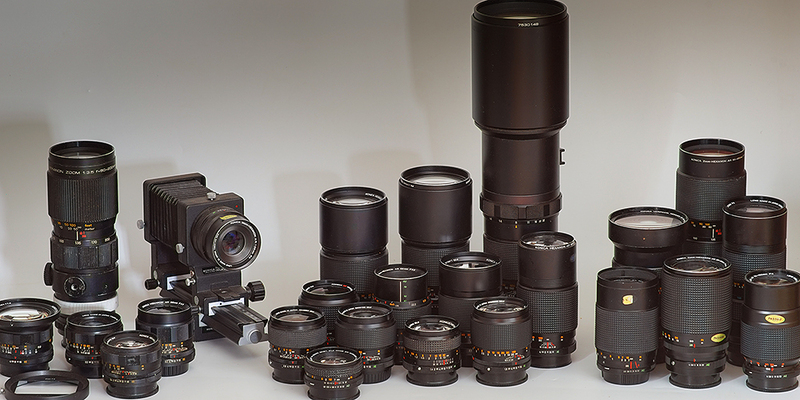 A bunch of nice Konica AR lenses - on the left side the earlier versions with metal focusing grip, in the center some nice primes with rubber focusing grip, and on the right side a few classical Konica Hexanon zooms. On the left: Konica Hexanon AR 4/21mm, 3.5/80-200mm zoom, 3.5/28mm, 1.4/57mm and 2.8/35mm, and the later bellows with 4/100mm. Center, back row: Konica Hexanon AR 3.5/200mm (a Sonnar-like construction), AR 4.5/300mm and ARM 4.5/400mm. Right, back rows: the huge and somewhat unusual varifocal Hexanon AR 2.8/35-100mm, then the zooms 3.5/80-200mm, and the later 4/80-200mm UC. Righht, front row: Konica AR zoom 3.5/35-70mm, AR 4-4.6/28-135mm with 18 lenses, and the 4/75-150mm UC. Konica AR lenses - not to be confused with the earlier Konica F lenses - are well respected among users of vintage gear. The more common lenses are usually a bit underrated, but several primes optically are as good as their Canon / Nikon / Minolta counterparts. Others are bit disappointing since their construction is from the mid-1960s and was never updated until Konica stopped selling SLRs in 1987. The barrels are rugged and feel solid. Compared to contemporary Minolta MC prime lenses, focusing is a bit stiff, and the aperture ring is quite difficult to turn.